P000636 WHS Horse drawn street car Click here for more information on image. With summer comes construction. However, the spring and summer of 2015 has been memorable for the impact of construction of the LRT (light rail transit) in Kitchener and Waterloo. What makes this season of the detour particularly meaningful is discovery of old street railway track on King Street, buried beneath layer of asphalt. As we built a new transit system, the remnants of the Berlin and Waterloo Street Railway Company system have a vibrant story to tell. In essence, light rail transit is not new to Waterloo Region. Its story is buried beneath our streets and beats in the hearts of local rail aficionados. The original 1886 charter holders of the Berlin and Waterloo Street Railway Company included William Snider, John B. Snider, Simon Snyder, Daniel L. Bowman and Herbert J. Bowman. They sold their interests to an American organization in 1888, which included local capitalists, after several years in delays in getting the line built. Thomas M. Burt of Boston was sent to Berlin to oversee the construction of the line and manage the company. In order to meet an amended Waterloo by-law for start of construction by 1 July 1888, the ceremonial first spikes were driven in Waterloo and Berlin by their respective mayors on 30 June 1888. With a deferred completion date of 1 August 1889, Burt acquired the charter for the Berlin and Waterloo Street Railway Company. 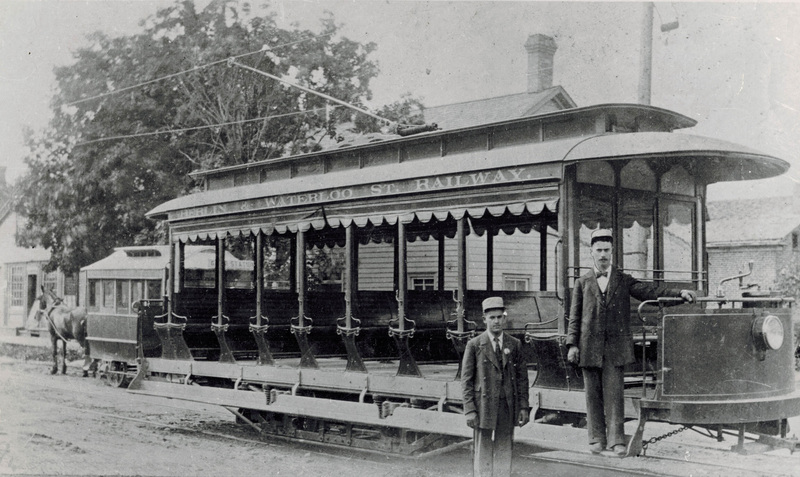 The history of the street railway operations began in 1889, when a railway line was laid down along King Street between Waterloo and Berlin. It ran along King between Cedar (now Bridgeport) in Waterloo and Scott Street in Berlin, with a turn out or passing track at the centre of the line. The line was built with “T” rails between Water (Berlin) and Allen (Waterloo) Streets, and flat or “L” rails in town centre areas. A car and horse barn, which eventually accommodated 8 cars and 17 horses, was built at King and Princess Streets in Waterloo. 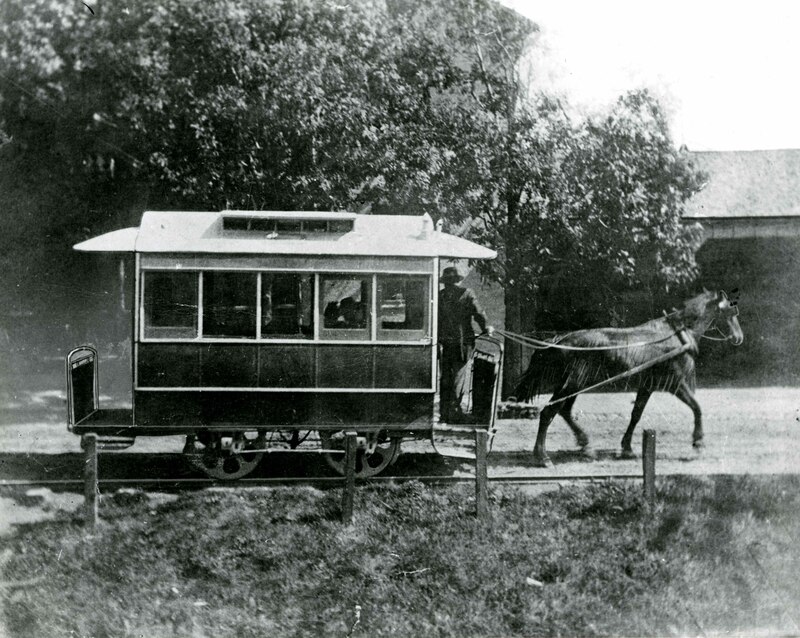 The syndicate operated the line as a horse drawn railway until 1894, when the switch was made to electric power. On 13 June 1889, the first street car from Waterloo crossed the Grand Trunk tracks in Berlin and travelled as far as Scott Street, the eastern end of the line. 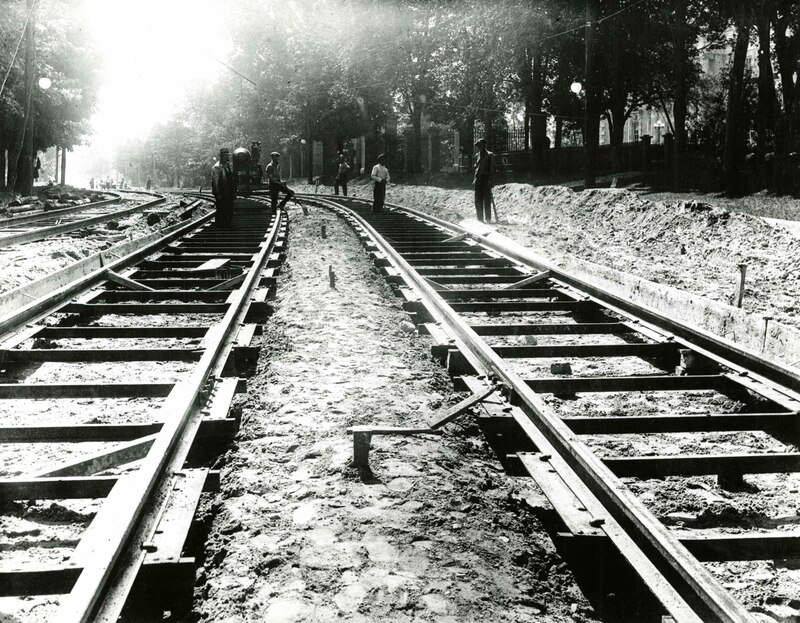 Construction of a feeder or branch line from King along Water and Weber Streets to the Grand Trunk station followed. Cars bearing the bold letters “Royal Mail” carried the mail from the train station along this line and then down King Street to the Post Office. 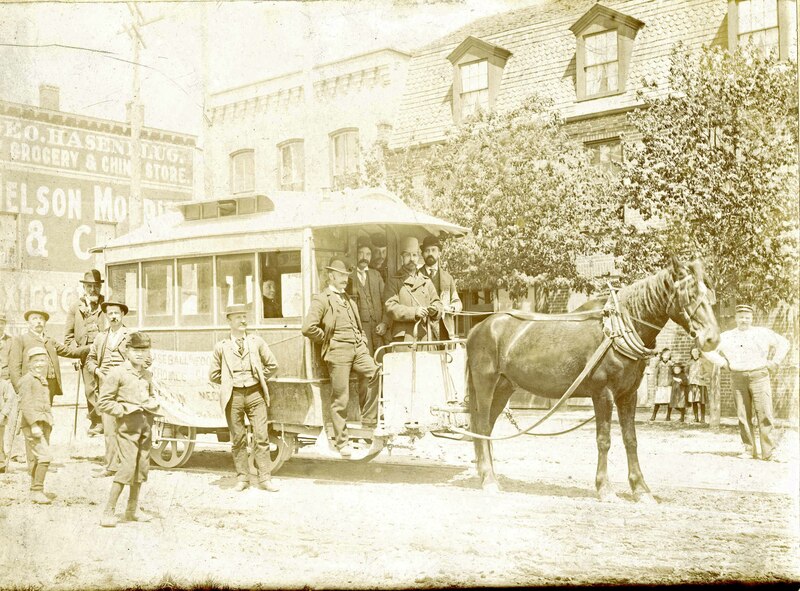 During the horse drawn rail days, driver Henry U. Clemens ferried the horses, two of which were known as Joe and Kate, (Kate was a grey mare), up and down King Street. Service started at 6:40am from the Waterloo car barns and continued every 1.5 hours. Two cars, journeyed up and down King Street during the day, carrying 10-15 passengers per car. The last car left Waterloo at 9pm and made the return journey at 9:40pm from Scott Street in Berlin, arriving in Waterloo at 10:20pm. Late night revelers had to listen carefully for the sound of the last ride bell which the horses wore for the final trip back to Waterloo – otherwise, they were left to their own devices for the long walk back home. It was estimated by Clemens that each of the two rail cars carried about 400 people per day. P008456 KPL Berlin and Waterloo Street Railway car in Waterloo, 1892 Click here for more information on image. Stay tuned for more posts in the coming weeks about the Berlin and Waterloo Street Railway Company. Next time, we’ll look at the electrification and the growth of the system. As always, your comments are welcome!